Clutching his hands above his head in triumph, Vladimir Kramnik celebrated victory in his exhausting and acrimonious world title match against Veselin Topalov on Friday. 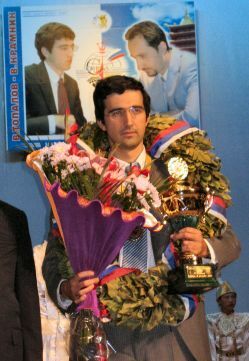 Kramnik has become the first undisputed World Champion for 13 years after defeating Veselin Topalov by the narrowest possible margin in Elista. Kramnik's manager Carsten Hensel, watching with the rest of Kramnik's team from the audience, could not contain his emotions, crying out in joy and leaping onto the stage where Kramnik had just won the decisive fourth game. In contrast Topalov's manager Silvio Danailov, whose protests had almost caused the match to be abandoned after only four games, looked grim as he realised that all his off-board efforts to help his countryman take the title had come to naught. The GM seconds on Topalov's team were nowhere to be seen. After the main match had been drawn 6-6 - including a controversial forfeit against Kramnik in game 5 - the two players were required to complete a series of four rapid games. The playoff match took a topsy-turvy course; after a first game draw Kramnik had taken the lead in the second game, Topalov equalised with a crushing attack in the third, only to see Kramnik convert the smallest of advantages into a win in the fourth and final game. Kramnik's main reaction after the three week title match appeared to be relief, expressing his desire to "rejoice and get drunk with my friends". At the closing ceremony at a local theatre, the traditional Kalmyk song and dance was followed by the award of a laurel wreath to Kramnik. For Topalov, who took home a small medal (as well as a $500,000 appearance fee) the result came as a bitter blow. After falling behind early in the match, the Bulgarian's team had tried a series of off-board tactics to unsettle Kramnik, diminishing the world number one's reputation and ultimately failing to gain the undisputed world title that both players craved. Topalov was unrepentant; "I dominated the match, was better prepared and had the initiative in most games. It's my fault that I lost." Nonetheless, Topalov did not view the loss as the end of the world; "I am only 31 and I still have many invitations to tournaments." Topalov and Danailov will at least have the consolation of flying out of Elista on Saturday in the Bulgarian Presidential jet while Kramnik takes a scheduled flight to Moscow with his team and most of the journalists who stayed in Elista throughout the three week contest. Possibly only when Topalov and Danailov are removed from the isolation of Elista will they realise that Kramnik's win was genuinely welcomed by 90% of chess fans around the world – fans in numbers big enough to cause both the official tournament web site and the ChessBase site to overload and crash during the playoff. When Danailov's complaints about Kramnik's bathroom habits were placed alongside Kramnik's decision to complete the match despite the game 5 forfeit, most fans believed that what would have been bad for chess is for Danailov's protests - aided by incompetence or cowardice from both the Appeals Committee and the arbiter - to have succeeded in handing the title to Topalov. Topalov is the first to vary from game 2, where he organised a spectacular attack after 15.Ng5 but lost the game after missing a forced mate. 15…Rc8 16.f4 Bxe1 17.Rxe1 Bg6 18.Bf1 Rc2 19.b3 Qa5 20.Bb5 Rd8 21.Re2 Rcc8 22.Bd2 Qb6 23.Rf2 a6 24.Bf1 Rc6?! Perhaps only expecting Topalov to try a g4 and f5 plan, Kramnik misplaces one of his pieces and is forced to scramble to avoid queenside problems. 25.b4! Rc2 26.b5 a5 27.Bc3 Rxf2 28.Qxf2 Qa7 29.Qd2 Ra8 30.Rc1!? Encouraging Kramnik to grab a very hot pawn. 30.Bb2 Rc8 should be satisfactory for Black. 30…Nb6 31.Bb2 Nxa4 32.Ba3 h6 33.h3 Be4 34.Kh2? An unlucky choice, after which Black is able to rescue his knight through an ingenious tactical sequence. Too late, Topalov realises that 38.Bb3, which would be strong in most positions, here allows 38…axb3!! 39.Rxa7 Rxa7 when White has no good answer to 40...Ra2. Heading straight for a draw since 42.Rxa4 Rc1 is fine for Black. Running out of patience, but the endgame is not so simple for Black. 20.Nxd4 Qe5 21.Qxe5 Nxe5 22.Nc2! g5? It is imperative for Black to prevent 23.f4 – last move it was restrained by the …Bc5 pin – but the text move creates serious weaknesses. 22...Bc5 was sensible and roughly equal. There is no longer a good answer to White's threat of 30.a4, since 29...c4 30.Bd4 Nfd7 31.Ne4 is very comfortable for White. The rest is easy for Kramnik, since every exchange makes the passed pawns stronger. 1.d4 d5 2.c4 c6 3.Nf3 Nf6 4.e3 Bf5 5.Nc3 e6 6.Nh4 Bg6 7.Be2 Nbd7 8.0-0 Bd6 9.g3 dxc4 10.Bxc4 Nb6 11.Be2 0-0 12.Nxg6 hxg6 13.e4 e5 14.f4! exd4 15.Qxd4 Qe7 16.Kg2 Bc5 17.Qd3 Rad8 18.Qc2 Bd4 19.e5 Nfd5 20.Rf3!? A strange choice, since 20.Ne4 gives White a safe edge. Avoiding possible problems with f5, but now the fixed pawn structure means that Black must always be alert to a kingside breakthrough. 26.Qe2 Kf8 27.Rd1 Qe7 28.h4 Rd5 29.Qc2 Nc4 30.Rh1 Na3 31.Qe2 Qd7 32.Rd1 b5 33.g4!? fxg4 34.Rg3 Ke7? Finally Kramnik cracks under the pressure. He wants to avoid a pin along the f file after 35.f5 but instead makes the advance even stronger. 34...Qe6 was playable, although with a safer king Topalov will always have better chances in the coming time scramble. Black's king has no good square since all other king moves walk into 37.Bxf5!. The losing move. After 37...Qc7 Black is hanging on, although after 38.e7 R8d6 39.Rxg4!, with the idea 39...fxg4 40.Rf1, Black's survival chances are slim. 1.d4 d5 2.c4 c6 3.Nf3 Nf6 4.Nc3 e6 5.e3 Nbd7 6.Bd3 dxc4 7.Bxc4 b5 8.Be2 Bb7 9.0-0 Be7 10.e4 b4 11.e5 bxc3 12.exf6 Bxf6 13.bxc3 c5 14.dxc5 Nxc5!? A new move which seems quite satisfactory for Black. 14…0-0 is usual. 15.Bb5+ Kf8 16.Qxd8+ Rxd8 17.Ba3 Rc8 18.Nd4 Be7 19.Rfd1 a6?! Unnecessary. 19…Ne4 works out well for Black but Topalov probably missed that 20.Nxe6+ fxe6 21.Bxe7+ Kxe7 22.Rd7+ loses to 22…Kf6 23.Rxb7 Nd6!. Brilliantly calculated. Topalov now spent all of his five minute time advantage and more trying to find a way to exploit the loose positioning of White's pieces but eventually came to the conclusion that everything hold together. 21…Be4 22.Rb3 Bxa3 23.Rxa3 Nc5 24.Nb3 Ke7 25.Rd4! Bg6?! The bishop is offside here and now White even takes over the initiative. After 25…Bd5 Black should be fine. 26…Nxb3 27.axb3 Rhd8 should be tenable for Black. Topalov seeks activity for his sacrificed pawn but Kramnik soon neutralises Black's initiative. 27.Nxc5 Rxc5 28.Rxa6 Rb8 29.Rd1! Rb2 30.Ra7+ Kf6 31.Ra1! Rf5 32.f3 Re5 33.Ra3! The final finesse – White is ready to move his rook to the b file and advance his a pawn. 33…Rc2 34.Rb3 Ra5 35.a4 Ke7 36.Rb5 Ra7 37.a5 Kd6 38.a6 Kc7 39.c5 Rc3 40.Raa5 Rc1 41.Rb3 Kc6 42.Rb6+ Kc7 43.Kf2 Rc2+ 44.Ke3 Rxc5?? A terrible blunder to end the match but after 44...e5 45.Rab5 White should win soon.